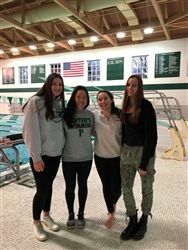 This week's athletes of the week are Marissa Chow '20, Maddie Beaule '21, Julianna Weir '22, and Madison Hagberg '22 from varsity swimming and diving. Varsity swimming and diving started their season with a win over Hotchkiss 107-76. Chow '20, Beaule '21, Weir '22, and Hagberg '22 played a huge role in this win scoring the maximum amount of points that could be scored by an individual. Chow '20 won 100 Butterfly, 100 Breaststroke, 200 Medley Relay, 200 Free Relay. Beaule '21 won the 200 Free, 500 Free, 200 Free Relay, 400 Free Relay. Weir '22 won the 50 Free, 100 Free, 200 Medley Relay, 400 Free Relay. Hagberg '22 won the 200 IM, 100 Backstroke, 200 Medley Relay, 400 Free Relay. Congratulations on a great start to the season and on being honored as athletes of the week!